The publishers of Saints Row IV and GAME have got together to create perhaps the most extravagant computer game SKU ever. This is a limited edition of one and is still available to pre-order at GAME, a UK video game retailer, at the time of writing. What do you get, beyond the game, for your $1 million purchase? The answer is lots of things and experiences including a Lamborghini Gallardo, a Virgin Galactic space flight, plastic surgery and much more. We have previously seen some other extravagant game special editions. In May Codemasters created a one-off GRID 2 SKU, costing £125,000, which included an actual BAC Mono Roadster sports car. Looking at similar gaming extravagance, also in May we saw the £90,000 Costco deal on an F1 racing car simulator. 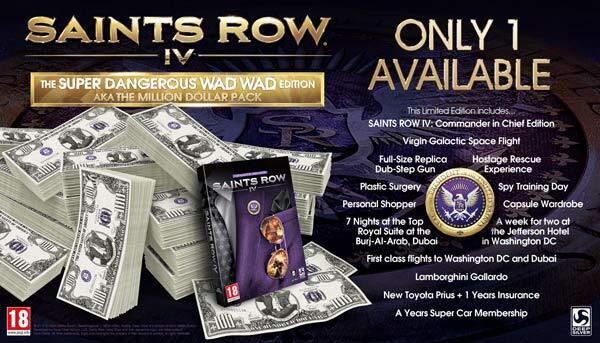 * please note the small print on this $1 million offer includes: "Koch Media especially reserve the right to remove or amend contents of the Super Dangerous Wad Wad edition". 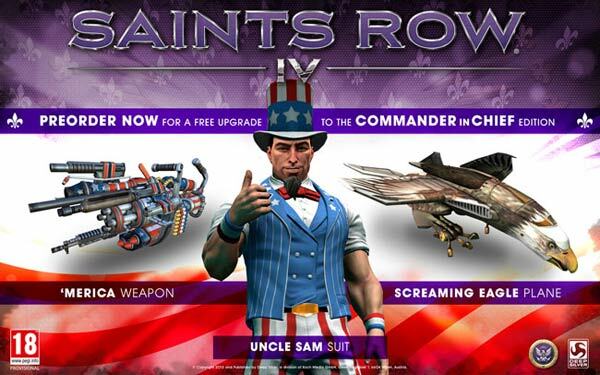 Also the game you get will be the Commander-in-Chief edition of Saints Row IV, which includes the 'Merica weapon, the Screaming Eagle plane and an in-game Uncle Sam costume. However other less wealthy folk, who choose to pre-order the PS3 or Xbox 360 editions, get automatically upgraded to the Commander-in-Chief edition. The game is released for PS3, Xbox 360 and PC on 23rd August. In related news the publishers of Saints Row IV had some difficulty getting the game past the Australian Games Classification Board due to some of the game themes involving drugs. The game was modified, with a mission removed, but due to the changes the co-op play in the Australian version is incompatible with the rest of the world. Nice publicity stunt, gets them free advertising… I wonder if anyone will do the cunning stunt move of actually buy it?